True or False Pope: PART I: CAN THE CHURCH JUDGE A HERETICAL POPE? ST. BELLARMINE SAY YES; MARIO DERKSEN SAYS NO. PART I: CAN THE CHURCH JUDGE A HERETICAL POPE? ST. BELLARMINE SAY YES; MARIO DERKSEN SAYS NO. CAN THE CHURCH JUDGE A HERETICAL POPE? ST.BELLARMINE SAY YES; MARIO DERKSEN SAYS NO. The problem with Mr. Derksen’s position is two-fold: First, the famous axiom, “the first see is judged by no one” did not originate with Vatican I, but has existed since the earlier years of the Church. Second, it has never been understood as precluding the possibility that a heretical Pope can be deposed, nor did the First Vatican Council define it as meaning such a thing. If Mr. Derksen believes the famous axiom prevent an heretical pope from being deposed (or declared deposed), it is due to his private interpretation of the axiom, which is contrary to how it has always been understood. In True or False Pope?, we spend three lengthy chapters, quoting theologian after theologian, to explain how a heretical Pope can be deposed without the Church having to claim jurisdiction over him, and without violating the famous axiom. Simply put, if a Pope publicly holds to a heretical doctrine (not simply an error, but a true heresy), the proper authorities in the Church issue solemn warnings (as a matter of charity, not jurisdiction), informing the Pope that the doctrine he holds is heretical, and providing him an opportunity to renounce the error. If he fails to do so, one opinion holds that he ceases to be Pope and is declared deprived of the pontificate, another opinion maintains that he is authoritatively deposed by Christ when the Church performs a ministerial act. Both of these opinions are just as acceptable today as they were before Vatican I. The famous axiom did not originate with Vatican I, but dates back to the early 4th century. It is found in the Synod of Parma (501-502 A.D.), and was used by Pope St. Nicholas in Proposueramus Quidem (685 A.D.), by Pope St. Leo IX in the Epistle In Terra Pax Hominibus (1053 A.D.) and by Pope St. Gregory VII, in Dictatus Papae, (1075 A.D.). “Therefore, others affirm the Church is superior to the Pope in the case of heresy, but this is difficult to say. For Christ the Lord constituted the Pope as supreme judge absolutely; even the canons indifferently and generally affirm this; and at length [teach that] the Church does not validly exercise any act of jurisdiction against the Pope, nor is the power conferred to it by election, rather [the Church] merely designates a person upon whom Christ confers the power by himself. Therefore on deposing a heretical Pope, the Church would not act as superior to him, but juridically and by the consent of Christ she would declare him a heretic and therefore unworthy of Pontifical honors; he would then ipso facto and immediately be deposed by Christ…”. Notice that Suarez carefully navigates the famous axiom by saying that the Church does not act superior to the Pope, but only declares him a heretic and unworthy of the papacy, at which time Christ authoritatively deposes him. Mr. Lane obviously believes it is permissible for a private person to “judge” a Pope to be guilty of heresy and declare the “fact” publicly (as he and his fellow Sedevacantist have done with the recent Popes), but does not believe it is permissible for the Bishops to do so. On the contrary, the Church does indeed have the authority to judge papal heresy (the matter of heresy), as well as the right to establish if the Pope is pertinacious - neither of which violate the axiom “the first see is judged by no one”. What the teaching of Suarez shows is that he was well aware of the famous axiom – which was later repeated (not invented) by Vatican I - and did not believe his position violated it; neither did any of the other theologians we quote in the book, as evidenced by the fact that they all refer to it. Since Vatican I did not define the precise meaning of the phrase, but merely repeated the axiom itself, it cannot be said that the meaning the earlier theologians attributed to the phrase can no longer be held. Can the Church Judge Papal Heresy? from before Vatican I, we will quote a recent author whose authority we are sure he will accept – namely, his mentor, Fr. Cekada. Before doing so, however, we should note that Fr. Cekada praised Mr. Derksen’s article, declaring it to be “dynamite demolition of True or False Pope”. Here is a screen shot taken from Fr. Cekada’s twitter account. Now, we find this to be quite curious, since Fr. 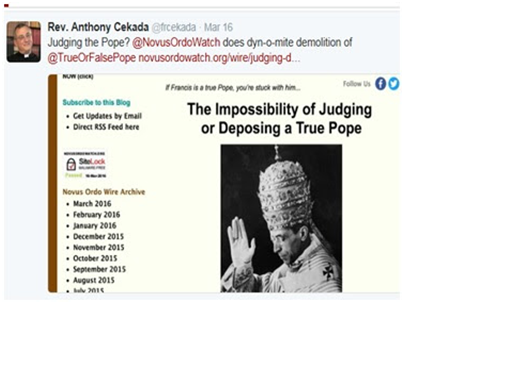 Cekada himself has argued that “the first see is judged by no one” does not preclude the Church from judging a pope in the case of heresy. In response to an article written by Chris Ferrara, Fr. Cekada argued that the famous axiom is merely 1) a procedural norm which exempts the Pope from coercive juridical power (e.g., summonses, appeals from his decisions, etc. ), and 2) means the final decisions of the Pope on doctrinal and disciplinary matters are binding, and cannot be appealed to a general council. “(A) Context: Any first-year canon law student knows that it says no such thing. The maxim “the First See is judged by no one” is incorporated into the Code of Canon Law as canon 1556. … which prescribes which ecclesiastical courts have jurisdiction to try which types of cases. While it is true that the pope has the final say on doctrinal and disciplinary matters in the Church … the maxim itself merely means that there is no ecclesiastical tribunal before which one could summon the pope or to which one could appeal the pope’s final judicial decision. The maxim ‘the First See is judged by no one’ is a procedural norm, then. 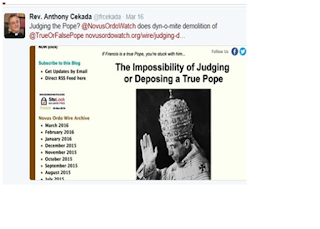 If anything, one can conclude from this the very opposite of what Mr. Ferrara maintains: defection from the faith is the one sin of a pope we are permitted to judge. Now, if we didn’t know any better, we might have guessed that Mr. Derksen’s mentor, Fr. Cekada, got the foregoing explanation straight out of our book, since that is pretty close to how we explained it, even if we use a little more nuance and provide a more thorough explanation. As we have seen, Vatican I repeated (not invented) the famous maxim that “the First See is judged by no one,” and its affirmation (not definition) of this ancient maxim obviously does not nullify the centuries old teaching that heresy is the exception to the rule. The maxim and the exception have always co-existed, and both have been quoted by Popes, canonists, and theologians going back to the earliest centuries of the Church. The theologians we quote in our book were all well aware of the famous maxim, and they were all careful to avoid violating it when they explained how the Church can oversee the deposition of a heretical Pope. In Part II, we will address the Second and Third Opinions of Bellarmine, and see that Bellarmine himself quoted Pope Innocent and the Canon Si Papa when defending that an heretical Pope can be judged by the Church. We will also comment on a quotation from Billot, which Derksen cites in an attempt to show that Bellarmine did not mean what he explicitly said. We will show that Mr. Derksen has taken the quotation out of context (which he actually admits) and that it in no way suggests what he claims. where can I read an english translation of all of bellermines opinions? I want to read it myself. Not take anyones opinion on it. We quote the First, Second and Third Opinion (along with our comments) in Part II, which should be posted later today. We will also include them in their entirety in a footnote so they can be read without any comments interspersed.